Fourth Row Center: Film Writings by Jason Bailey: On DVD: "Ice Age: Dawn of the Dinosaurs"
It’s just plain unfair to compare the films of Blue Sky Studios to those of Pixar, simply because both outfits are trafficking in family-friendly computer-generated animation. Pixar doesn’t just outpace Blue Sky in terms of technical acumen and storytelling skill—they’re outdoing pretty much every other studio in town, animated or not (name me five live-action filmmakers who could have pulled off the first twenty minutes of Up and I’ve got a nice shiny quarter for you). Blue Sky, the house behind the Ice Age trilogy and Horton Hears a Who, have always positioned themselves as the Warner Brothers to Pixar’s Walt Disney, the crowd-pleasers engaging more in slapstick and sheer fun, without quite so much artfulness. On those terms, it is more accurate to compare them with Dreamworks Animation, the pop culture-riffing, low comedy-embracing creators of Kung Fu Panda and the Shrek films. There, the comparison is apt—particularly in critiquing the third film of their signature series, where both Shrek the Third and Ice Age: Dawn of the Dinosaurs find a brand watered-down and showing its age. 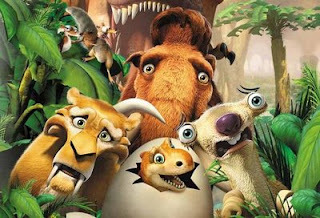 The first Ice Age was a genuinely funny and clever movie, mixing its Looney Tunes-style slapstick with inspired voice performances by stars John Leguizamo, Denis Leary, and (especially) Ray Romano, whose dry, nasal delivery was somehow a perfect match for Manny, the big lunk of a wooly mammoth it inhabited. A little of Leguizamo’s lisping, manic sloth Sid goes a long way, but his energy was nicely balanced by Leary’s growling but good-hearted saber-toothed tiger, Diego. The sequel, Ice Age: The Meltdown, added Queen Latifah’s Ellie (a female mammoth) to the mix, as well as her opossum brothers (long story) Crash and Eddie. Dawn of the Dinosaurs finds our heroes settling down into a life of domesticity. Manny and Ellie are expecting a baby mammoth, and Manny is preparing by attempting to baby-proof just about everything. Diego fears he’s losing his edge; when he’s easily outrun by a snarky gazelle (Bill Hader), Diego decides he has to leave the herd because he’s become too domesticated. Sid, meanwhile, longing for a family of his own, discovers a trio of dinosaur eggs that he ends up keeping and trying to raise on his own; when the dinosaur mother comes to retrieve her young, she takes Sid too. So as with the first two films, Dawn of the Dinosaurs is a quest movie—Manny and the gang’s search and rescue of Sid. The primary addition this time around is Simon Pegg (Shaun of the Dead), who lends his voice and considerable spark to the character of Buck the one-eyed weasel, a thrill-seeking jungle adventurer who helps them on their journey (of a butterfly they encounter, he notes: “I knew that guy when he was a caterpillar. You know, before he came out”). As before, the animation and character designs are lovely—the big, fluffy mammoths, the angular saber tooth, etc.—while the slapstick is mostly successful, particularly the wordless scenes with Scrat the squirrel, which frolic in a conspicuous silent movie aesthetic. But much of the verbal humor falls flat. While Sid’s sweet attempts at parenthood are charming and occasionally amusing (“I’m a single mother with three kids!” he pleads. “I could use a little compassion!”), and Romano gets off a couple of good lines (“All right, well, good luck with the slow descent into madness, we gotta go…”), poor Leary mostly plays boring straight man, and Crash and Eddie primarily function as a distraction. The climax works, pulling its threads together nicely with a lovely wrap-up, but it doesn’t make up for the dearth of real laughs (and by real laughs, I mean ones that aren’t based in bodily function and fluid) along the way. It’s a sweet enough kids movie, but it doesn’t deliver the goods for grown-ups. As with the Shrek movies, the Ice Age series is starting to feel like a TV sitcom in its twilight years, leaning on its past successes and the comfort-food quality of its familiar characters without working up much in the way of new inspiration or genuine laughs. Though it has its moments, Dawn of the Dinosaurs is ultimately a throwaway. "Ice Age: Dawn of the Dinosaurs" hit DVD and Blu-ray on October 27th.